Samford University’s Cumberland School of Law recently recognized four alumni for their contributions to the law school and the legal community. The 2016 Alumni Award winners will be recognized during a reception on Friday, April 8, as part of the law school’s annual reunion weekend activities. Dean Henry C. Strickland, III will present the awards. 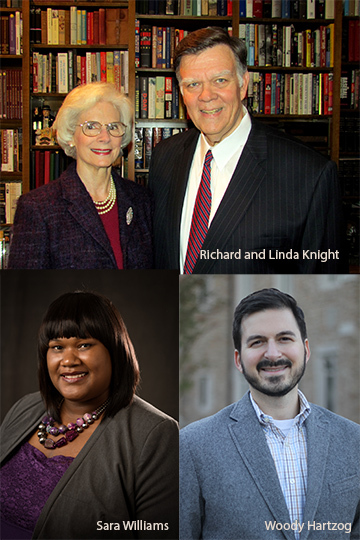 Honorees include Richard H. Knight, Class of 1976, and Linda W. Knight, Class of 1976, Distinguished Alumnus of the Year; Woodrow N. Hartzog, Class of 2003, Young Alumnus of the Year; and Sara L. Williams, Class of 2006, Volunteer of the Year. The Distinguished Alumnus Award is given to a Cumberland School of Law graduate who has distinguished herself/himself in the practice of law, service to the community, and leadership in the profession. This year, for the first time, a married couple is being recognized. In addition to celebrating their awards this year, the Knights will celebrate their 45th wedding anniversary. After graduating third in her law school class, Linda W. Knight started her legal career as Balch & Bingham’s first female associate. After the Knights relocated from Birmingham to Nashville in 1980, Linda clerked for a Tennessee Supreme Court Justice before joining a boutique firm that grew into what is now Gullett, Sanford, Robinson & Martin, PLLC. In 1998, Governor Don Sundquist appointed Linda to serve a six-year term as a founding member of the Tennessee Economic Council on Women. In 2006, she was appointed by Speaker of the House Jimmy Naifeh to be a founding member of the Tennessee Ethics Commission, governing lobbying and public integrity, serving until 2010. Over the years, Linda was nominated and selected to become a Fellow of the American Bar Foundation, the Tennessee Bar Foundation, and the Nashville Bar Foundation. A list of Knight’s additional professional and community involvement is lengthy, compelling, and evidence of her true devotion to national, state and local interests. In 2014, the Governor’s Commission for Judicial Appointments voted on three nominees to fill a vacancy on the state Supreme Court. Linda and one other applicant tied with the most votes. Although the Governor ultimately named the other “first-place winner” to the court, Linda’s dedication to her profession makes her a “first-place winner” to Cumberland School of Law. After graduating from the Virginia Military Institute, Richard H. Knight served in the Regular U.S. Army for over three years. With most of its lawyers serving in Vietnam, the Army provided intensive specialized legal training to non-lawyer officers, including Richard. He successfully prosecuted seventy special courts-martial without one loss. That experience motivated him to go to law school. Knight spent many years of his legal career with Hospital Corporation of America and served as an in-house counsel with two life insurance companies and a medical software company, and as General Counsel of the Tennessee Department of Health. Richard, who holds an M.S. in Health Administration from University of Alabama at Birmingham, was co-founder and CEO of the Tennessee Advanced Neurodiagnostic Imaging Institute. Knight has been a member of the American Arbitration Association’s Large Complex Case Panel for twenty-five years, and has continuously donated legal services to tax-exempt start-up businesses and nonprofits. In 1984, Richard was a Ronald Reagan delegate to the Republican National Convention. Outside of the legal community, Richard devotes his time to several heritage organizations, including the Society of the Cincinnati, the Jamestowne Society, and the Order of Founders and Patriots. The Young Alumnus of the Year Award is given to a Cumberland School of Law graduate, who graduated within the last 15 years, and who has distinguished herself/himself in the practice of law, service to the community, and leadership in the profession. Cumberland School of Law Associate Professor Woodrow “Woody” N. Hartzog is an internationally-recognized expert in the area of privacy, media, and robotics law. He has been quoted or referenced in numerous articles and broadcasts, including NPR, the New York Times, the Los Angeles Times, and USA Today. Hartzog’s work has been published in numerous scholarly publications such as the Columbia Law Review, California Law Review, and Michigan Law Review; and popular national publications such as The Guardian, BBC, CNN, Wired, Bloomberg, New Scientist, The Atlantic, and The Nation. He is also a contributor to Forbes and a frequent guest contributor to LinkedIn, Concurring Opinions, and other popular blogs. His book, Privacy’s Blueprint: The Battle to Control the Design of New Technologies, is under contract with Harvard University Press. He has testified twice before Congress on privacy and data security issues, given talks at the corporate headquarters for Google, Microsoft, and Facebook, and at events hosted by U.S. Federal Trade Commission and Japan’s Ministry of Economy, Trade, and Industry. In addition, Hartzog presented research at educational institutions including the University of Cambridge, the University of Tokyo, Yale Law School, and the University of California, Berkeley. Hartzog teaches torts, intellectual property, privacy law, and media law. He is the recipient of the Harvey S. Jackson Excellence in Teaching Award and the Lightfoot, Franklin & White Faculty Scholarship Award. He has served as a visiting professor at Notre Dame Law School and University of Maine Law School. Before joining the faculty at Cumberland School of Law, Hartzog worked as a trademark attorney at the United States Patent and Trademark Office in Alexandria, Virginia and as an associate attorney at Burr & Forman LLP in Birmingham, Alabama. He also served as a clerk for the Electronic Privacy Information Center in Washington, D.C.
After receiving his B.A. and J.D. at Samford University, Hartzog earned a Ph.D. in mass communication from the University of North Carolina at Chapel Hill, and an LL.M. in intellectual property from the George Washington University Law School. He is an Affiliate Scholar at the Center for Internet and Society at Stanford Law School. He also serves on the advisory board of the Future of Privacy Forum and on the academic advisory council of the Asia Pacific Institute for the Digital Economy (APIDE) at Keio University. The Volunteer of the Year Award is given to a Cumberland School of Law graduate who has provided exceptional volunteer service to the law school and its constituents. The recipient has distinguished himself/herself by assisting in multiple facets of the law school program. While in law school, Sara L. Williams served as chief judge of the Trial Advocacy Board, president of the Black Law Student Association, and successfully competed with Cumberland’s National Trial Team. Her competition participation was not limited to the law school trial team, but extended to the ABA National Mediation Team as well. Since graduating from Cumberland School of Law in 2006, Williams has been a litigator. She started her career as a civil defense attorney and now maintains a busy litigation practice representing plaintiffs. Cumberland students have directly benefited from her litigation experience over the past seven years. Since 2009, Williams has spent hundreds of hours as a volunteer coach of our National Trial Team members. As a direct result of her coaching, Cumberland students have excelled and the trial teams have reached numerous successes year after year. Cumberland School of Law maintains its highly-ranked trial advocacy program largely due to volunteer coaches such as Williams. Cumberland’s Alumni Reunion Weekend will continue on Saturday, April 9, with a luncheon and open house for graduates, families and friends, and individual class reunion gatherings in the evening.